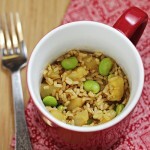 Brown Rice with Edamame and Pineapple is an easy, vegetarian meal-in-a-mug that you can make in minutes. In a 16 ounce mug, combine rice and water. Place edamame on top. Cover with a small plate or sauce. Microwave on high for 5-6 minutes or until almost all of the water has been absorbed. Remove from oven and let stand, covered, for 1 minute to absorb the remaining water. Stir in pineapple and teriyaki sauce. Microwave, uncovered, on high for 30-45 seconds or until pineapple is heated through. Let stand for 30 seconds. Stir, then season to taste with hot pepper sauce. Sprinkle with cashews and any of the optional items.